Like many mountain communities, improved access to markets, schools and medical care is a key concern; but these narrators, being members of different minority peoples, express a more powerful sense of having been isolated from the outside world. For many, language is an issue. One Miao woman (China 12) has become a doctor, which she acknowledges makes her almost unique, and she explains that many Miao women come down to the town especially to see her: "We are here really for those women. Sometimes too many people come. There is not enough room for them to stay at my home. But bearing in mind that they can't speak Han, I feel they are very pitiful… because they don't speak Han, they can't communicate with other people around, and are afraid of being scolded, afraid of this and that. So most of them come to see me… our attitudes are good, and we can treat the diseases well, we are kind to them in all aspects, won't scold them." 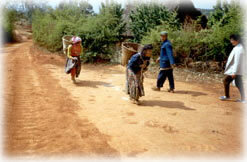 One woman who has become an agricultural extension worker, emphasises the extent to which her Lahu community feels disadvantaged by their lack of contact with the outside world: "People who live on the plains wear better clothing, they have more access to outside information and have a better life. People who live in mountain areas, because they don't have access to information, they cannot see what others do well - they appear to be more foolish" (China 16). Several narrators confirm her view that for these communities a key aspect of improved communications means greater access to information, ideas and example. And one woman, who travelled in her youth as part of a traditional dancing group, happened to mention that she plants many more vegetables than the rest of the villagers: "Other families - they rarely plant…. Anything can be found in my yard, such as spinach, green vegetables, and these days there are onions, garlic... I can't name them all." When asked how she learned how and when to plant these, she replies: "I have been away from this village to other places for a while; I learned from others" (China 26). Roads are a key requirement for development in the view of every narrator: "Transport? In the past, we were longing for it… if you wanted to build a house, trucks cannot come in and we didn't have tractors. We had to go outside to buy the cement and tiles, and then use horses to carry them back" (China 25). Most of the communities described now have road access of some sort, but one woman (China 24) lives in an as yet unconnected village: "The hospital is far away… if a seriously sick person needs to go to the hospital, it takes at least 15 or 16 people to carry him or her… In this place, because there is no road, living conditions are worse. Everything needs to be carried by people. There are potatoes but they are too heavy to carry. If there is no horse, you cannot carry them by yourself." More than one narrator points out that roads can bring problems too. The Maio doctor (China 12) describes her shock at seeing the deforestation in her home area, now accessible to outsiders using trucks: "[opening up to] transport has advantages but also disadvantages. In the past, when people from the plain came… people would steal one tree. Now one truck can carry 10 people - at night trees were easily taken away on the truck. But they have nothing to cut down now." "We Lahu people have had no chance to receive education, we cannot read newspapers and we don't know about the farming experience of other places." "Yes, we were longing for the road very much… Once it had been built, people who had better living standards bought horse carts. If we didn't have the road, our children…would never have a chance to see a bus…When the bus comes, groups and groups of people surround it and look at it." "…after we have road access, everything can be transported out for sale. Many children had never seen a truck, a car - or even a tractor before. This year, once the road had been built, we saw cars. The children can be in touch with everything. This is the benefit." "It will be good if the TV aerial can be connected to our village, or to our village office, so that the whole village can…follow the information shown on TV to improve their living conditions…[and] follow the changes in society…"
"Last year, this small road was built, we were very happy about it… The government paid some money, and we provided the labour… My [husband] was the team leader; he led the villagers to build it… No one was excused [from the work of road building]." "Places near the roadside or the plain were more likely to be disturbed by people… at my parents' house, the fruits were ripe and fell all over on the ground. But they lived far from the plain, so people seldom went to plunder their place. We here are close to the plain; people come to cut the firewood [and fodder] all the time… They drove a tractor to carry the fodder back… whenever they saw that there was no one around, they would pick the melons and steal people's vegetables."